"My first collection is about humanity. The collection is about stories and feelings we all share as human beings. I've tried to draw attention to the feelings we reveal in our expressions which is the only thing from our inside that's visible to the outside world. My aim is for you to be humble and acknowledge the fact that we all share some of the same. Each artwork is for you to interpret, even though we share some of the same, we do as individuals see and perceive differently - Best, Christiane." For artist and thinker Christiane Spangsberg's first collection all it took, for the most part, was one line; just one line, a one of a kind. How evocative just one one can be. I was first introduced to this Copenhagen artist's work via instagram, one of these moments where you find yourself utterly intrigued by what you see, you enthusiastically click through to the linked page, subsequently finding yourself immersed in a world... and in this case, a creative process. For me, it was foremost Christiane's work that did the talking, though in addition to this, her creative thinking and personal response to every comment below each image made me not only want to invest in the work, but in the person behind it. That's one of the advantages of a platform like instagram, when used correctly you can draw a relationship between the work and the artist, each enriched by the other. In truth, I've not been as excited about an artist or their artwork in a very long time. There is something so evocative about Christiane's portraiture work, just that one line moving so effortlessly around the page. 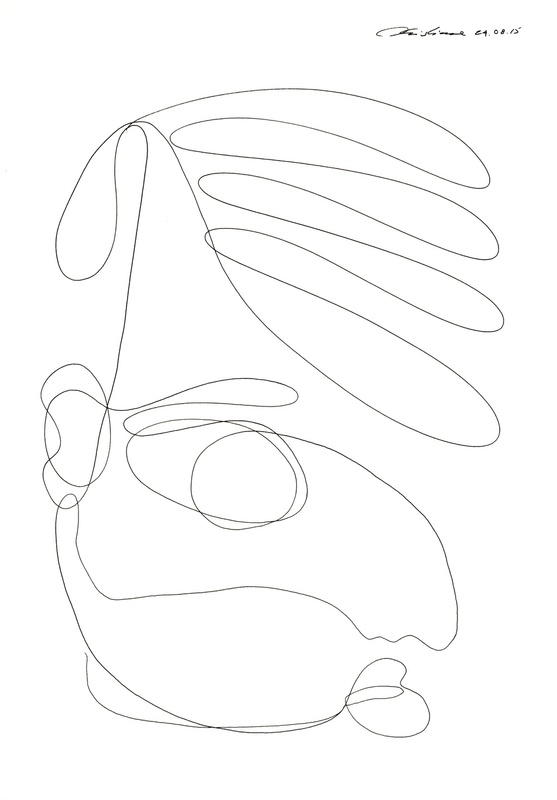 Every curve, every corner presents an emotional response, each line playfully interacting with one another, bouncing back and forth to create one artist's interpretation of a face. Individually imperfect. Even beautiful - just as we all are, in our own right. ARTIST | Christiane Spangsberg WORKS ARE AVAILABLE TO PURCHASE DIRECTLY FROM THE SITE.